Mute Swan is one of the most elegant and instantly recognizable water birds of all the wild birds. 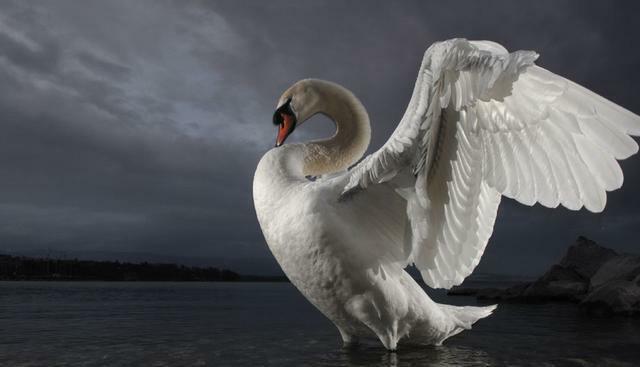 The Mute Swan is identified with its gracefulness and the elegance with which it swims across ponds and lakes. This beautiful bird is usually identified by a black knob at the base of its bill. 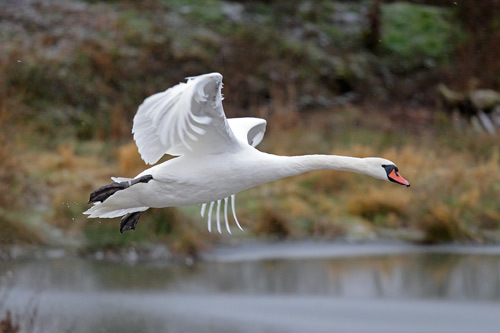 The Mute Swan has a gracefully curved S shaped neck, an orange bill with a black knob at its base. The male Mute Swans are called cob and females are called pen. Mute Swans belong to the Anseriform order and Anatidae family which are subdivided into geese, ducks and swans. Native to the Europe, it was brought to the other states during the 1800s as an ornament to the parks and other water bodies. The Mute Swans are large water birds with dazzling white plumage. They are around 56 t 62 inches long and with a wingspan of 79 to 94 inches. They stand around 47 inches tall. On an average the male Mute Swans weigh around 12 kilograms and the females weigh around 9 kilograms. They have an orange bill with black border and a black knob at the base of the bill. The male Mute Swans are larger than the female and also have a larger bill. The Mute Swan has a gracefully S shaped neck. All the adult Mute Swans have white feathers except on their neck and near the bill where the feathers might be stained a little brown or orange due to iron content in the water. The Mute Swans were introduced to North America during the 18th century. They were found naturally at the temperate regions of Europe and across the western Asia. Since the Mute Swans are partially migratory and according to the UN Environmental Program chart, the Mute Swans were habitant to 70 countries, there were records of Mute Swans breeding in 49 countries and wandering in 16 different countries. They are spread across the northern latitudes of Europe and Asia. The Mute Swans are generally found in shallow water bodies including ponds, lakes, coastal bays, wetlands areas, marshes, streams, slow flowing area, large fresh water areas and estuaries. Mute Swans feed on aquatic plants, exclusively on submerged aquatic vegetation (SAV), like read head grass and widgeon grass and animals. It is estimated that the adult male swan eats up to 4kgs of aquatic vegetation everyday. They feed on underwater plants by plunging their long neck inside the water. They may also feed on small fishes, insects and frogs. In urban ponds and lakes the Mute Swans also enjoy the bread which is offered by the visitors. On an average the Mute Swans live for 5 to 6 years in the wild but they can live for almost 25 years in domestication. The Mute Swans mate for life. They may start pairing when they are a year old, they become sexually mature within two years, however may start breeding when they are three, four or five years old. They breed in the same place year after year and begin building their nest in March and April. They built their nest at a secluded place near the water body. The male swan collects materials to built nest and the female swan arranges them. They become aggressive during the breeding season.The Cob keeps an eye on their partner on the nest and protects their female from any intruders or any danger from the predators. If they see danger, they become aggressive and charge the intruders by hissing and flapping their wings. The incubation period of the Mute Swan is 35 to 38 days. After the incubation period the pen lays 4 to 8 eggs which are greenish brown. 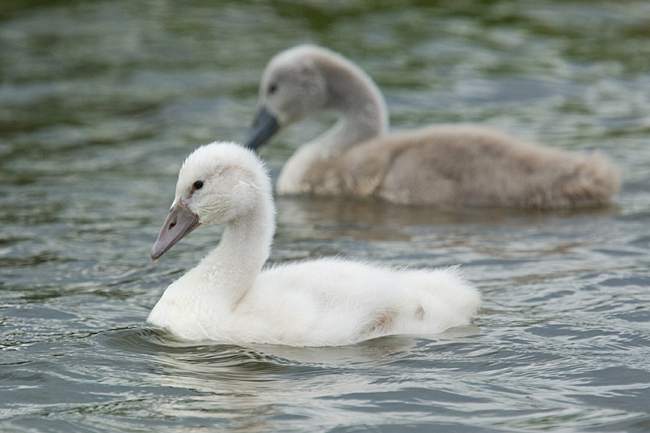 The cygnets (young swan) are initially ash grey and then develop brown feathers. It is only after 6 to 7 months that they develop the long neck and the white plumage. Since Mute Swans are large birds they don’t have many natural enemies. There are few predators and threats that the Mute Swans have to encounter. Lead is still used in many parts of the world for fishing and hunting. Discarded lead fishing weights still impose a threat of lead poisoning to the Mute Swans. Swallowing the discarded fishing hooks and their feet getting entangled in them. Most of the Mute Swans do not migrate. Some may take a short distance migration during winters in search of a warmer place or for food. Mute Swans are beautiful yet harmful invasive species. They have not been a matter of conservation since they quickly increase their population in fewer spans of time. Such population causes danger to the specific aquatic plant species. An adult swan can feed on four kilos of aquatic vegetation in a day. Overgrazing on aquatic vegetation causes direct negative impact on the waterfowl. Huge population of the mute swans can cause overgrazing of the submerged aquatic vegetation resulting in the depletion to the extent that they cannot fully recover affecting the area’s biodiversity. Mute Swans are doing well and are not the species that requires conservation concerns. Some states still ensures its safety by banning the use of lead weights for fishing which contaminates the water and directly or indirectly hampers the Mute Swan population. Mute Swans were brought from Europe to enhance parks and estates. Many states consider it a pest because it overgrazes ponds and its preference for feeding on submerged aquatic vegetation such as wild celery and jeopardizing the reproduction of them. The Mute Swans often mate with the same partner for life. They change their partner if their partner dies. If the male swan loses its partner and remates with a younger female, then the female shifts into his territory. However if it mates with an older female than the male swan shifts into her territory. 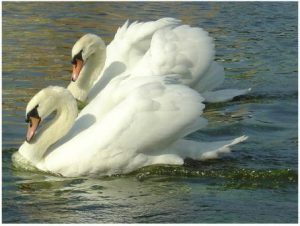 If the female swan loses her partner, she usually chooses a younger male swan as her partner. The young Mute Swan (cygnets) usually comes in two color morphs. The cygnets having grey down develop grey brown and white feathers and the cygnets with white down develop white feather but they both ultimately look alike later on. The white morph adults have pink or grey legs instead of black. During the breeding season the black knob of the cobs swells and becomes larger than that of the female swan. The name “mute” is derived from the fact that they are quiet during their flight else they communicate through grunts and barks. Mute Swans can live up to 20 years but their average life span is just 7 years. Earlier days, the feathers of the Mute Swans were used for writing purpose. They were named as pen quills, later it was named quill pens, and then modified to only pen. Hence the name of the present day ball pens is named after the feather of the female swan. The picturesof the Mute Swans are given above. No problem. We have swans thru the winters here on Long Island, ny. Our swans nested recently with 7 eggs. We have noticed the last couple of days that the female is leaving the nest for long periods of time to be with her mate. Is this normal? Do they abandon the nest? The swans always come back and continue their lives. We have two lakes in our development, each lake hosting a pair of swans with cygnets. One or the other of the mature swans disappears for a while, but they always re-appear. If you follow their lives, the swans (or any other creatures, really) will fill any void you may have in your soul.